This is a soup, and a little like a stew, and I think Rachael Ray calls it a stoup, because it’s a little bit stew and a little bit soup. I combined a lot of different recipes for this one, and used a lot of ingredients from the pantry as well. I served alongside a toasted baguette with goat cheese. A perfect ending to a chilly day and just in time for soup season! And did I say filling? it is a meal in itself. There are a lot of ingredients, but it really did make this soup wonderful. I enjoyed the prep, it’s very therapeutic and it’s not difficult at all. I find it is very very important to read through a whole recipe before starting to cook, because you don’t want any surprises 1/2 way through and I always set out all of my ingredients before I start cooking, don’t want to be running around looking for an ingredient. You can also substitute wherever you’d like in this recipe using ingredients you would prefer. Enjoy! 1 whole Rotisserie Chicken ( skin and bones removed and shred meat) (store bought is perfect here) unless you are in the mood to roast a chicken. 1 cup small pasta , like ditalini. I used small elbows because that is what I had on hand. 2 Tablespoons Pesto , I happen to have some frozen, but buy the store bought one if you don’t happen to have this on hand. Heat 2 Tablespoons of Olive Oil in a large heavy pot ( Le Creuset) or any Dutch type Oven. Add the pancetta and cook for about 6 – 8 minutes over medium low heat, stirring occasionally , until lightly browned. 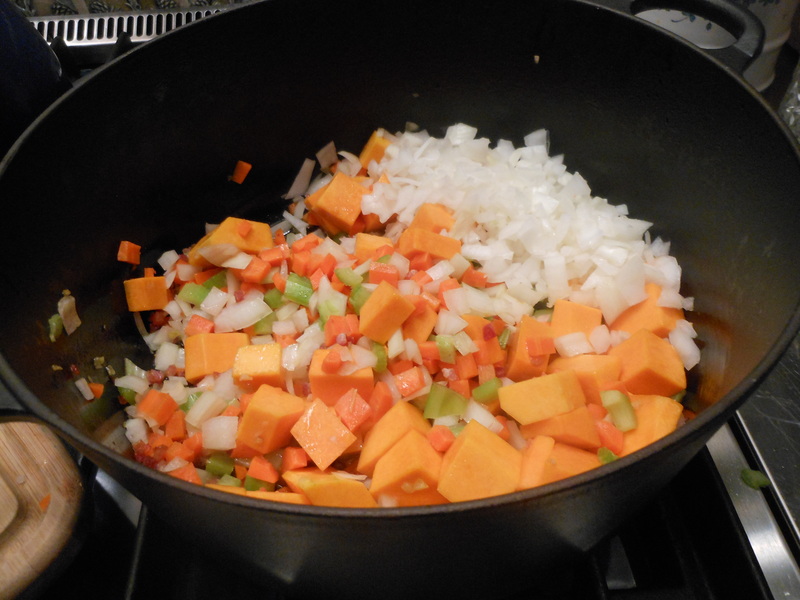 Add the onions, carrots, celery, squash, garlic and thyme, and cook over medium heat. I cooked for about 12 minutes till everything started to break down and soften. Add the can of tomatoes, 6 cups of the chicken stock, bay leaves, I added 2 teaspoons of Kosher Salt and about 1 teaspoon of freshly ground black pepper. You can taste later and add if you need more. Bring to a boil, and then simmer for app. 45 minutes to an hour. I cooked pasta separately till al dente. 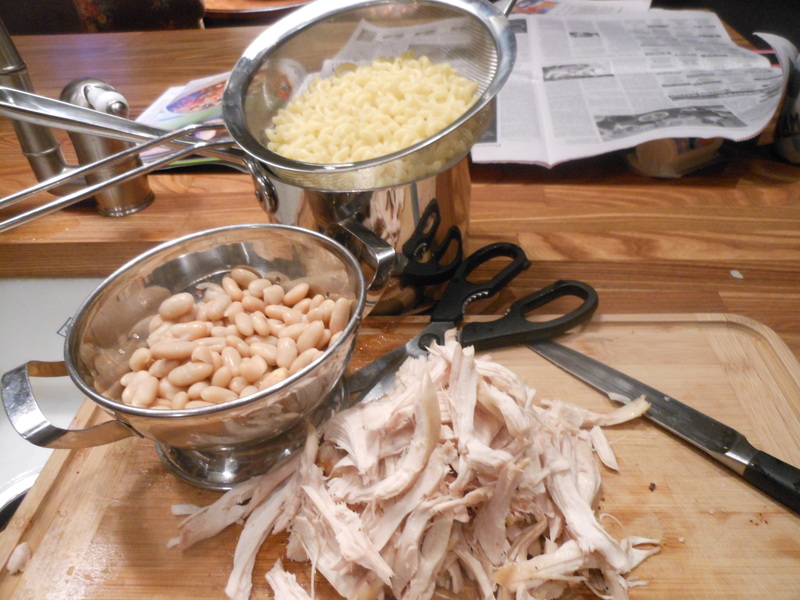 Discard bay leaves, add pasta , beans and shredded chicken to soup. Heat through. Soup should be quite thick and if it’s too thick add some more chicken stock or some water. Just before serving if you’re using it add in the spinach a little at a time, I used very little because Joel really doesn’t care for it, use as much as you’d like, keep stirring. Stir in the white wine and pesto. Check for salt and pepper. Serve in nice large shallow bowls, with bread on the side. Sprinkle with parmesan cheese if you’d like. I sliced a baguette on the diagonal and brushed olive oil on both sides, Baked in the oven at 425 degrees, turning bread once , total cooking time about 8 minutes, took bread out and spread some goat cheese on each slice and put back in the oven for about 4 minutes. Delicious! 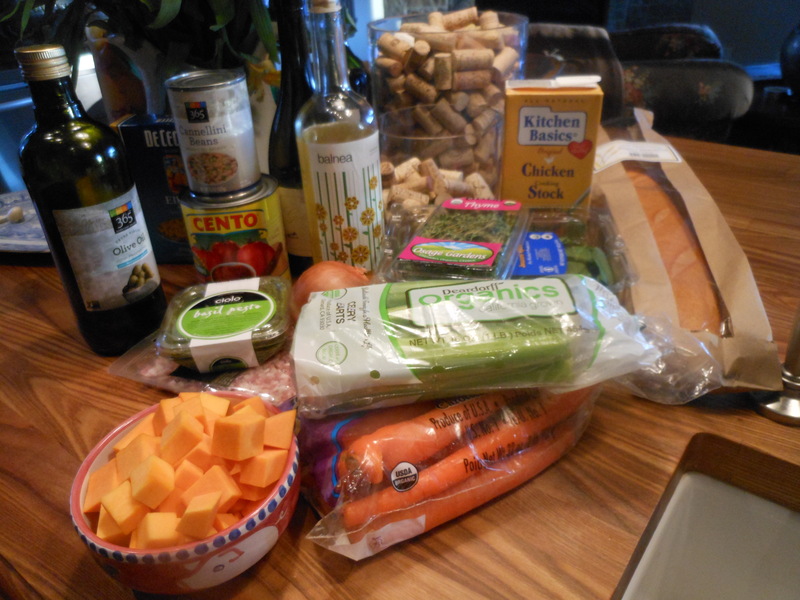 This entry was posted in soup, vegetables and tagged Goat Cheese Baguettes, Rotisserie Chicken in Soup, soup, Vegetable Soup with Rotisserie Chicken, Winter Veggie Soup with Chicken. Bookmark the permalink.